If you're in a position where you feel that your Airbnb listing could be performing better as a 24-hour sales person for your property - you're probably right! 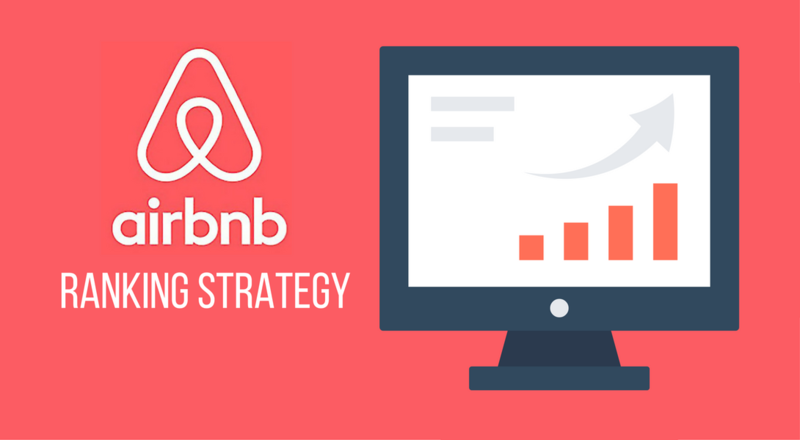 I want to walk through a strategy today that will help you increase your Airbnb listings search rankings with 1 (and a half) days work. Yes, it's going to take a few weeks for you to see results. But it's well worth the work because when you finish, you will know your listing is better because of simply adding more relevant descriptions to your listing and grabbing people's attention when you have it. Each city has a set average for the amount of people searching for an Airbnb in your city and that's just the normal bandwidth. What we'll do today is optimize your listing so that it's able to capture that bandwidth as much as possible. Search Engine Optimization. AKA "SEO." Very simply, it's the craft of making a particular search result appear as close to the top of the first page as possible. Usually this topic revolves around Google's search engine, but today I want to talk about getting your listing to the top of Airbnb's search results. The great thing about the search engines like Airbnb, Amazon, Etsy, & Ebay is that they are "buyers search engines". Meaning that when people use the search bar on those platforms, they're looking to spend some money and are either researching or about to make a buying decisions. 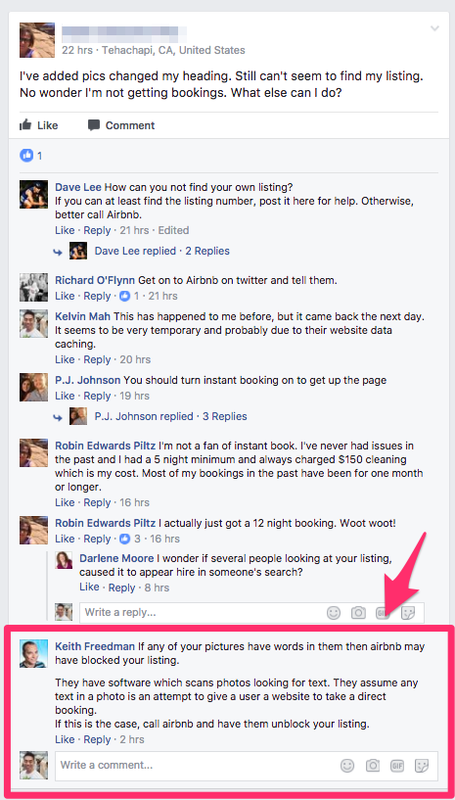 Before we get deeper into how you can improve your Airbnb search rankings, let's talk about why your Airbnb listing is not showing up. I've had this happen to me and it seems that Airbnb's listing results change quite a bit every day. Possibly even every hour. This wouldn't be surprising as Amazons product listing rankings change every hour too. 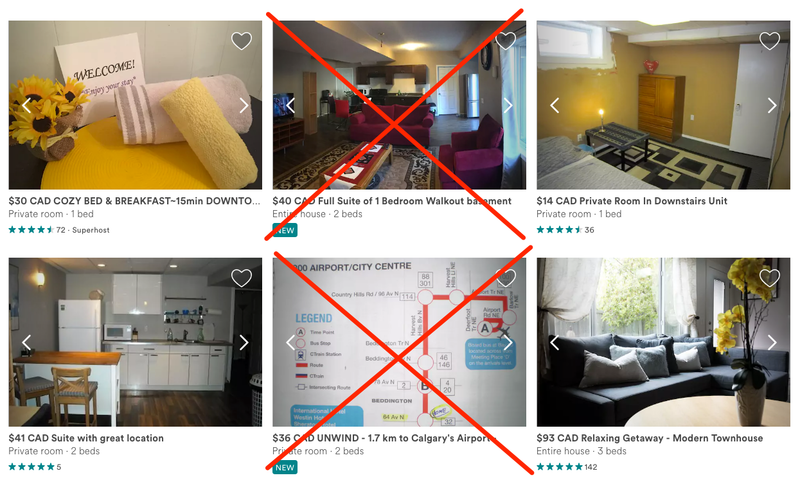 If your Airbnb listing doesn't show up on any page within your city, it might be just temporary. Why? I don't know. But I can tell you that I've experienced my own listing disappearing but later on to reappear on the same page I saw it last. This could simply be due to the Airbnb data being refreshed. So don't worry if you don't see it there after one search. 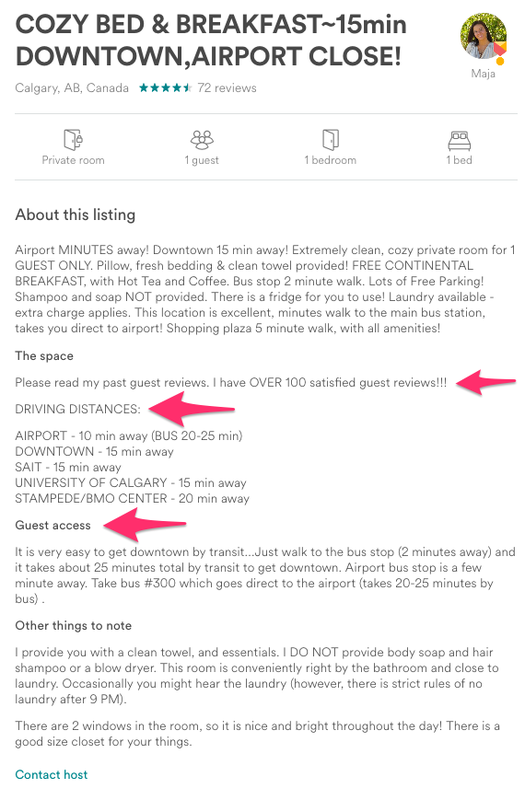 If you search for it 2 more times and it's not there - I would contact Airbnb support. 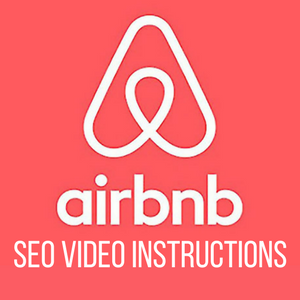 The technical Airbnb seo strategy is something we do once and then measure the results. However, there are other aspects that you should incorporate into your daily routines for being considered a "good host". A good host will naturally be favored by Airbnb's search engine as your good profile will increase the companies "social proof." 1. Be hyper responsive to incoming messages from potential guests. Always have the last say. For example, if someone says "Alright thank you", then respond back saying "No problem! Let me know if you have any other questions. If not, see you soon." This way, Airbnb knows you were the last to write in and your overall response score is improved. So in other words, the person waiting for a response is yourself. Which is always good. Airbnb wants people to hang around and use their platform more. This is a good way to help them drive traffic back to the platform. 2. Use instant bookings because one guest always leads to another. I've found that I will get tons of instant bookings in a row. Especially during the weekends when most are planning their trips these days. Many first time users have vouchers and most hosts don't allow instant bookings without some requirements. This means, new guests wouldn't have any of those requirements so it's up to you how you want to handle those requests. Generally, these new guests are further down the "booking cycle" than the rest who don't have a coupon in hand. 3. Don't be afraid to make the "ask." This means adding call-to-actions in your listing description. Ask people to message you or ask them to book with you. It's the number one thing I see in the differences of listing quality and what separates the high converting listings from the low converting ones. Those are three super simple ways to increase your bookings through daily maintenance. Now let's get to the fun stuff! To start off, let's get familiar with a few definitions we'll be using throughout the post. They aren't hard to pickup or understand, but should be useful for you to understand how a search engine thinks. Search rankings = Where your listing appears in the search engine. Are you on page 1 or 17 for your particular city-wide search and are you on the top of the bottom? Keywords = These are the questions and queries people are typing into the search bar. Whether it's Airbnb or Google. Search suggestions = These are the other queries that Airbnb or Google assume you are looking for and offer them as suggestions when you type. Keyword density = Essentially this is what a word cloud calculates. It's the most commonly used word or phrases that exists from a chosen set of text. We'll use this to analyze the top ranking listings in your area and the words they're using. 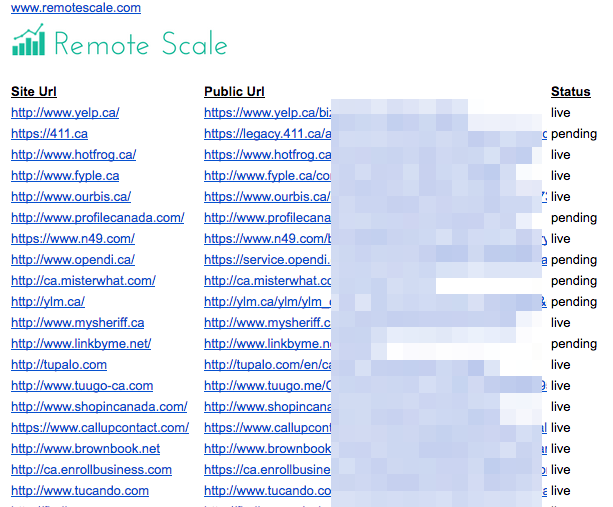 Local citations = This is only used for Google rankings and is comprised of how many times your companies name, address, and phone number appear across the internet. It doesn't have to include a link either, but having a link back to your site/listing is a big bonus. The name, address, and phone number have to contain the exact same information everywhere it appears across the internet landscape. To figure out where you want to go, you have to see where your standings are currently at. 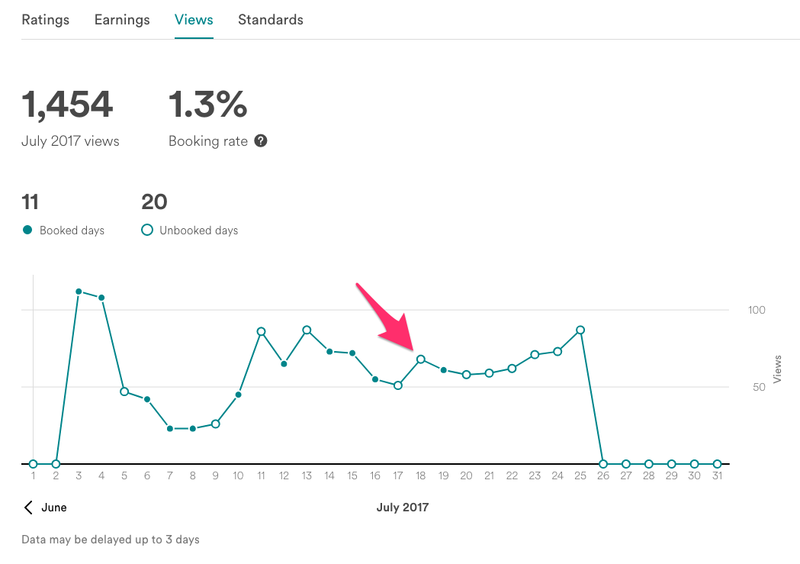 Write down your stats on the day you decide to start your Airbnb SEO campaign. The most important aspect here is the line chart for views, within your hosting dashboard. Booking rates are important too. However, it's likely going to decrease because the overall views to your listing will increase but you won't be everyone's cup of tea. Right now, we're first concentrating on a search strategy and then later we'll focus on the actual conversion strategy. To start off, look at the title of your listing and memorize the first 2 words. For example, mine is "2 mins" - which is short for "2 mins from downtown". Next, open a new incognito window in your browser. You need to do this as Google shows you results based on your location and we want to take this from a more global perspective as your guests are likely not from your listings city. After you open the incognito window, head over to Google and make sure you are searching within the appropriate version of Google. Meaning if you want to attract American visitors, then start from Google.com. If you want to attract more Canadian visitors, start from Google.ca. This doesn't matter too much, but there will be a slight effect. It's just better to start from exactly the place where most outside visitors are coming in from. Which is likely a Google search. Next, search for "Airbnb [your city]". Replacing [your city] with the name of the city your listing is in. Then click through to the first result and it should give you the exact page that people searching a city wide listing would land on. Here's the manual part, find where your listing appears for each guest count. Which means if your property can hold 4 people max, then you'll be doing the search 4 times. To help you guys out, there are 18 listings on each page normally (I'd count once to make sure it's similar on your end.) Then you can multiply the pages by 18 and then count up from the page your listing is on. Finding your listing easily can be done by searching for the text via your browser. This is usually done by "command F" for a Mac and "control F" for Windows. Before, we did all of this work manually but now we've developed our own tool called Rankbreeze (link here). Since Airbnb and other search engines mostly read written text. It's important to see how what type of words they see as being the most relevant to a particular search. If they notice that lots of listings contain the same word (ex. "park"), then Airbnb knows that there must be a park around there if everyone has that highlighted as a selling point. What we need to do next is analyze the most commonly used words found in each top listing. This means we aren't looking at "new" listings that appear on the first page, but the regular ones. Airbnb does favour new listings because they want new hosts to get some bookings under their belt so they can become more attached to the platform and it's really giving new hosts value early on. Nothing we can do about this, but the listings that aren't new have essentially earned their way up to the first page. Mostly from the various factors that we'll be going through. To make this easier, I would suggest starting this process with the guest count where you have the best rankings so far. If your best appearance is on the 3rd page for 4 guests in your city, then start with analyzing the top listings in the '4 guests' search. You're already the closest to the first page here, so it makes sense to optimize from here first. Most hosts have at least those 4 aspects in their listing and they are the first that appear on your listing. Save the report from the keyword density tool because we'll be using that later on. Search suggestions are the queries that Airbnb & Google suggests, once you start typing. This represents popular searches that are related to your city specifically. Start off by heading over to the main homepage for Airbnb.com and type in your city and press the space bar. See what search suggestions pop up in your local area. These are important because they're landmarks or events that searchers on Airbnb are interested in. The best place to incorporate these would be in your title or summary. As they're the first things that people see and it also helps Airbnb match you up to those particular searches. Write them down also because we'll be incorporating them now. Copy and paste everything you have already in your current listings and create a backup. Make sure to organize them so you know where each one goes. This is just precautionary as your next description may not be as good as your first one. It really depends on how much work you've done and how your writing skills are. In particular "copywriting." What Airbnb is suggesting to users in the search bar. 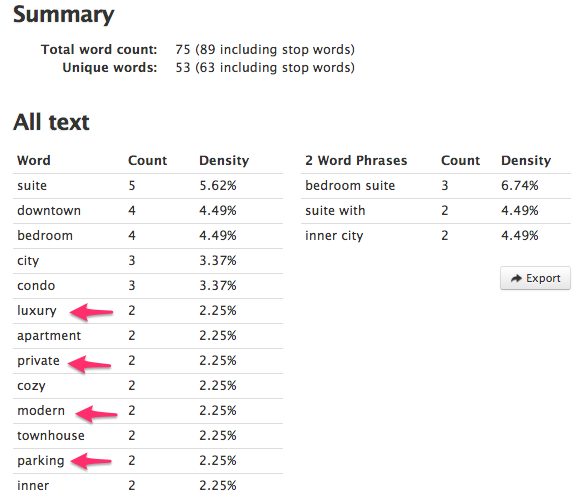 Top performing keywords in specific sections: titles, summary, space, and guest access. 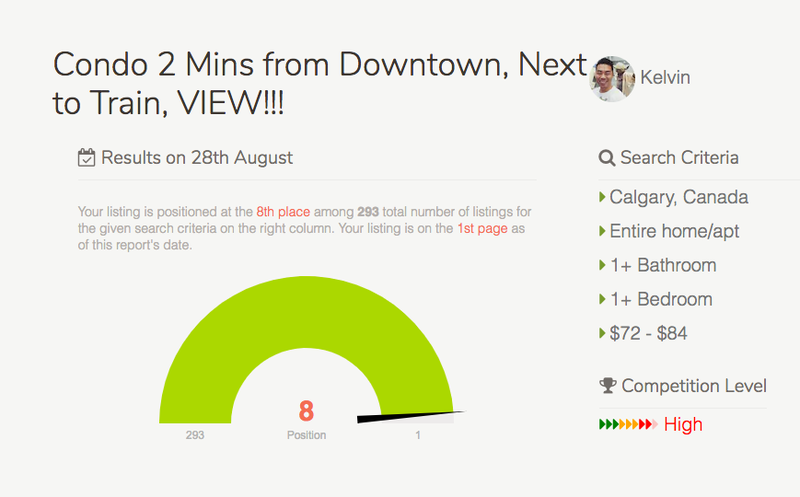 Now let's start rewriting those sections so they align with what the top performing listings are doing. Of course, each of your listings will be somewhat different but here are some quick tips I've gathered from very strong listings. 1. You can choose to adjust your title or leave it be. I didn't change my title as I thought it was better than the others I saw. When a potential guest searches for a place, they usually only see the first 5-8 words of your title. So make sure it's punchy and to the point. Also, keyword density isn't as important here because the sentences are so short. Each listing has unique characteristics so it's better to be more creative and look at examples of what others are doing for inspiration. 2. Incorporate details from the 'search suggestions' you collected into the summary or title of your listing. Things such as driving times or public transit times are really useful for guests. 3. Open each of the keyword density reports you collected earlier and look at the most common words for each part of the listing descriptions. For example, open up the keyword density report for 'summary' and see what are the most commonly used words are from the top listings you collected. Then sprinkle those words into your own listing. I have a video for you to see here if you are more comfortable with video instructions. There will surely be words that you are underutilizing to showcase your listing. 4. Add in Call-to-actions to your summary. I mentioned this earlier but it's important to highlight again while you're rewriting your descriptions. A call-to-action is simply asking them to reach out or giving them the next steps to book your place immediately. If you have any sort of guarantee, this would be the time to say it. A guarantee would be something like "$0 cancellation policy" or "personalized gift basket for each guest". Now that you've written out them out and you're happy. Save it. You've got a backup anyways in case you change your mind. However, at the end of this, you should be happier where you are now than you were before. Simply because the market has told you what is doing well. All of the steps we've gone through so far are focused on the Airbnb search engine. Now we can take it a step further and concentrate on the other side - Google. None of this is completely necessary but it's laying the groundwork for getting your specific listing to rank well in Google too. Remember when we typed in "Airbnb [you city]" before? Well with these next steps, we'll be adding more signals to Google that your listing is popular and worth paying attention to. Social signals aren't directly correlated with Google rankings, but setting an FB page for your place is an easy way to get a link back to your listing and most normal businesses have a Facebook page. Just start a Facebook page and make sure to name it "Airbnb [your city]". From the definitions, I listed at the beginning of the article, your local citations are your companies name, address, and phone number. All being exactly the same all across the internet. Using Yext and Synup, I had my team create 30 local citations across the internet from places like Yelp, Foursquare, Mapquest and more. The ones you use will be dependent on your country. Other popular places to start a profile would be Linkedin, Yellow Pages, and Yahoo Local too. The one thing that's annoying with local citations is that Google doesn't always pick them up (index them.) 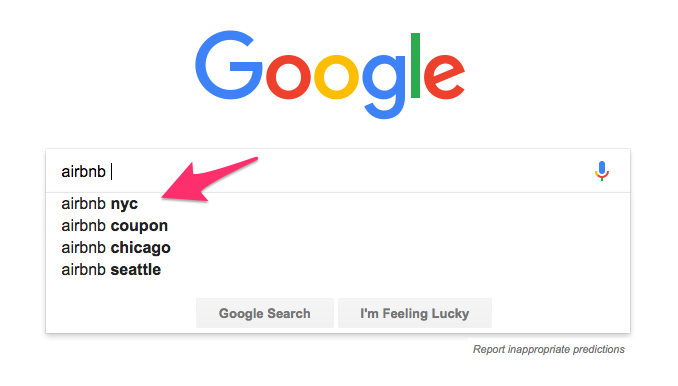 Here's a quick hack to see if Google picked up your local citations: Apply this search into the Google search bar of your local citations URL "site:www.insertyourcitationhere.com"
This should tell you whether Google indexed the page or not. Not all your citations will get indexed and some may take a few weeks so it's best to look at them a 3-4 weeks afterwards so you aren't wasting time going back and checking obsessively. I hope this walkthrough has been invaluable and you implement these right away, especially if you're thinking there's a lot more you can do with your listing. There's a ton you can learn just by looking at other successful listings. The work to do this is well worth it and if you need more help, just check out the video I have put together for you below. We'll go over a complete walk through of search suggestions, commonly used words, writing a compelling listing description and the local citations. See you there!